When I began working as a genealogist, my mother expressed great interest in learning more about her father’s family: the Muirs. While she had much information on her mother’s side of the family, which was quite large, she knew little about her father’s side of the family beyond her grandparents, so I began there. Though I found my grandfather and great-grandfather quite easily, my great-great-grandparents, William Muir and Margaret Kennefick, gave me some difficulty. I first discovered William and Margaret on the marriage record of my maternal great-grandparents, Frederick L. Muir and Mabel H. Lynch. 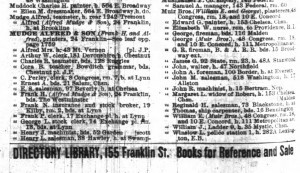 With this information, I tracked down the marriage of William J. Muir and Margaret Kennefick, which occurred in Boston on 17 February 1885, in Massachusetts Marriages, 1841-1915. The marriage record states that William was 27 at the time, placing his birth year circa 1858, and that his parents were Robert and Margaret Muir. Though I could not locate a birth record for William Muir, I was able to find him with his family in the 1860 Federal Census living in Charlestown in (what was then) Middlesex County; aged 3, he was enumerated with his father Robert Muir (age 30), mother Margaret (31), and brother Edward G. Muir (4 months). Sadly, Robert Muir died in 1867 at the age of 37, but even before then the records on the Muirs had dried up. William Muir and his family are nowhere to be found in the 1865 Massachusetts State Census, nor was I able to locate William on any census record prior to 1910. Exploring other options, I considered the possibility that Margaret (Lavery) Muir had remarried. After all, she had two young children, and a second marriage would have explained my inability to locate William if the children were enumerated under a stepfather’s surname. However, I was unable to come up with promising results. I also wondered if Margaret had moved her family outside of Boston, but that seemed unlikely, given that William was married in Boston and his son Frederick was born in the city. Having run out of other explanations, I was convinced that William Muir was still living in Charlestown, and that he was simply left off or incorrectly enumerated on the census. Therefore, the only way to determine where in Charlestown William Muir was living was by checking the Boston City Directory. 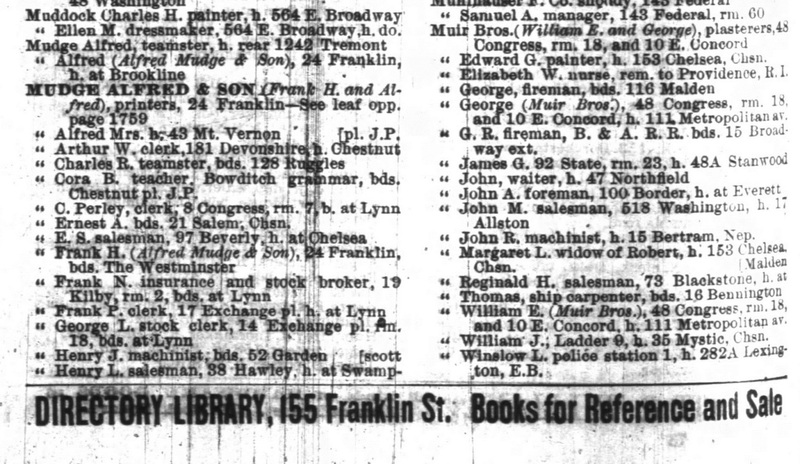 Beginning in 1892, the year my great-grandfather was born, I followed William Muir, fireman, through the directories until I found him living at 35 Mystic Street in Charlestown in the 1900 and 1901 directories. Then I began the lengthy task of searching page by page for the Muir family in Ward 3 of the 1900 United States Federal Census. When I finally located 35 Mystic Street, I was not surprised that I had been unable to find William; the Muir surname was practically illegible. I then discovered that Ancestry.com had incorrectly transcribed the surname as “Morris,” which explained why I couldn’t locate William even with a Soundex search. Though locating William Muir took some time, I was able to learn valuable information about him. Through the census records and city directories, I watched his profession change from laborer in the 1870s to (like his father) teamster in the 1880s before he became a member of the Boston Fire Department in 1890, a profession in which he remained for more than twenty years. Thanks, Katrina Fahy, this is really useful. Don’t know if you are aware of, or related to, a William Matthew MUIR buried in Punchbowl Cemetery in Honolulu. He was my Aunt’s brother and killed in action in Okinawa in WW II. HI Rick, I am related to this William Muir, my grandmother is Catherine Muir Swanburg, and my Mom is Sandra Swanburg. Catherine was William’s sister? And, would then be sister to my Aunt Mary, married to Ernest C.L. Bratt? Yes, I remember Aunt Mary and Uncle Ernie! William Muir Senior was Aunt Marys Dad, William Muir Was also the name of his only son who was killed by a sniper in the war, and is buried in the Punch Bowl in Honolulu in a beautiful spot! My Mom, Sandra, died in 2007 of Brain Cancer, Uncle Dave died in 2013 of cancer as well. My Uncle Craig Swanburg lives in NYC. I also remember Aunt Mary’s son “Ernie”, and his tragic death as well. I also remember Peggy and Linda! Wonderful example of how genealogy works, and some of the things that can lead us astray. I think a good streak of stubborness, enough to make us persevere as you did, is a necessary attribute for anyone nuts enough to undertake genealogy! I congratulate you on your success. I am going to use your example to prove to certain people that this is NORMAL behavior! Since you used Ancestry’s Census why not leave an alternate name in their census index and some comments? I even check on transcriptions of other, non-family members of a household. Last one was “Wm. Hove”. Yep, the enumerator’s central “a”s were usually left open and he tended to make made a squiggle of an R at the end of a name which still doesn’t look like his “e”s. “Hove” was actually “Hoar”. Scanners do indeed “live in vain”, as they have no souls.